WorldVeg showcased validated technologies at a major agricultural forum, attracting the interest of farmers and potential partners for future collaboration. An ethnographic study was conducted in Tamale, Northern Ghana, to understand whether vegetable gardening was a sustainable form of intensification. The study found that urbanization has prompted an increase in the cultivation of highly profitable vegetables like cabbage. However, they are irrigated with grey and waste water while eaten raw. This, and the use of pesticides in high dosages, poses health and environmental hazards. 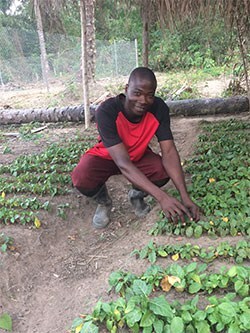 As part of dynamic livelihood coping strategies, some farmers in Ghana’s cocoa belt have diversified away from traditional cocoa production to other high-value crops including vegetables, to the extent of diversifying within vegetables. This study assessed the extent of diversification of vegetables among farmers in Ghana’s cocoa belt and determined the factors that explain the variability in the diversification indices. Resilience thinking, as an approach to agriculture development, focuses on enhancing the capacity of both the human and ecological systems inter alia. In this paper, the concept of resilience is approached from the perspective of socioecological systems dynamics.